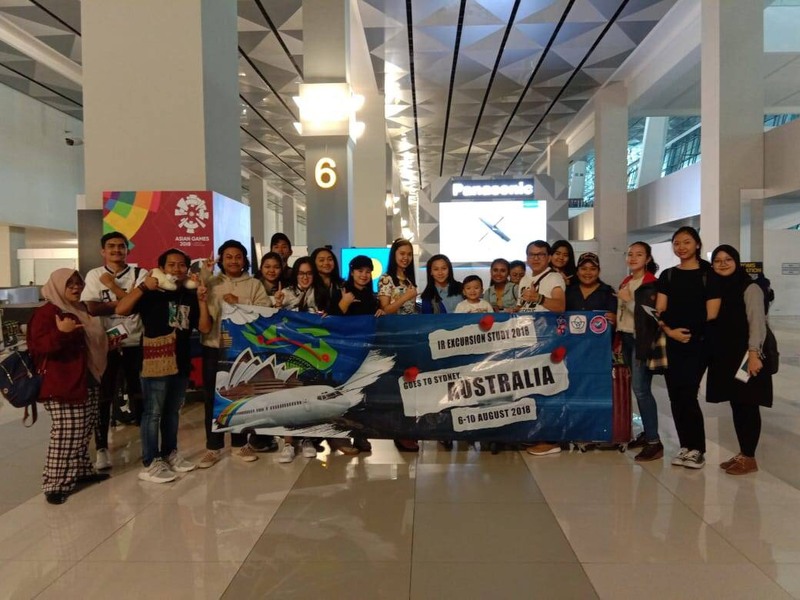 IRPRESUNIV.ORG, CIKARANG ̶ Monday (6/8) to Saturday (11/8), Foreign Affairs Division of PUMA IR under International Relations Study Program of President University had successfully conducted IR Excursion Study 2018 with Sydney, Australia as the destination. From August 6 – August 11, 2018, students from batch 2016 and 2017, accompanied by Prof. A. A. Banyu Perwita, Ph.D., one of the lecturers of IRSP, have had an insightful and fruitful trip. The participants landed at Kingsford Smith Airport, Sydney on Tuesday (7/8) at 10.00 A.M. local time, followed by a direct visit to to the Consulate General of Indonesia in Sydney with a warm greetings from Novan Ivanhoe as the Head of Protocol and Consular Functions and also from Zani Murnia as the Head from Infromation, Social, and Cultural Functions. Further, the participants got the chance to hear a remarks from Heru Hartanto Subolo, the consulate general himself, with the highlight on the work divisions of KJRI Sydney, along with the current bilateral relations between Australia and Indonesia, mentioning that despite the relations being similar to Tom and Jerry, the development of the recent years has brought both countries to have a fine relations until present, quoting that “we can choose our friends, but we cannot choose our neighbors”. The trip then continued to a walk to Chinatown, Sydney Harbour Bridge, and closed by a sunset-watching at Mrs Macquaries Point. On the second day, the trip started early in the morning to visit the ANCORS (Australian National Centre for Ocean Resources and Security) at University of Wollongong in innovation campus. Fruitful insights were given by several honorable lecturers and figures; Prof. Stuart Kanye (the ANCORS Director) gave an insight about ANCORS’ vision and mission, as well as the students who are pursuing their education at ANCORS; Ruth Davis (Lecturer for Masters Programs Coordinator) explaining about an inside view of master studies at ANCORS as well as scholarships given, which usually only provided for students attending naval academy or pursuing naval education; Dr. Chris Rahman in which he highlighted about Australia-Indonesia maritime security relations, mentioning to several extents the importance of the seas around Indonesia-Australia, one of them mentioned has high level dependence upon seaborne trade around 80-90%. Towards the end, Prof. A. A. Banyu Perwita, Ph.D., gave a presentation about International Relations Study Program of President University as well as the long established PRECIS (President Center for International Studies) which certainly has a close relations to the development of the studies itself. the agenda then moved to a tour to the main campus. Assoc. Prof. Phil Orchard and Pete Murray gave the participant a brief overview regarding International Relations as well as scholarships. Last but not least, the participants also had the chance to went around the UoW Library. The library itself provides 24/7 zone, quite study spaces, computer labs, panizzi gallery, and so forth. One interesting point is that the library provides VR (Virtual Reality) devices provided for the students to increase their creativity. The day was closed by a trip to Paddy’s Market. Darling Harbour was chosen as the main destination of the last day’s trip. The participants first visited Wild Life Zoo which has tons of iconic animals from Australia, and then followed by a walk to the iconic Sydney Opera House, a famous distinctive building of the century which served as a multi-venue performing arts center in Sydney, located right next to the sea, makes it a perfect destination to leave people in awe. Lastly, the participants visited QVB (Queen Victoria Building) Mall in the middle of the city. The building that was constructed in 1893 make it become a quite famous attraction for both tourists and locals. The trip was closed by a stride around Westfield. Friday (10/8), the participants safely landed at Soekarno-Hatta International Airport, marking the end of IR Excursion Study 2018.